Last year, our league provided 8 different playing levels that consisted of a total of 125 teams from 15 different organizations which resulted in 1800 girls playing softball during the regular season. The All-Star tournaments featured 8 teams at the 2/3 Division, 8 teams at the 4/5 Division, 7 Teams at the 6/7 Division and 6 teams at the 8/9 Division with a total of 401 girls participating. ​Our Fall Softball Program had 22 teams at 3 age levels with 330 girls participating. NOTE: You can nominate yourself or anyone else. If you don't have the Email address or know the Organization of the person you are nominating, just leave it blank. Also you don't have to fill in the biography, we will contact the nominated parties to get the information if needed. ​Gary Kevin Metzger, 73, of Lower Nazareth, died Sunday August 6 following a brief illness. He was the son of Llewellyn and Pauline Metzger (née Eckert), who preceded him in death. Gary attended Hellertown-Lower Saucon High School and Bethlehem Business School. He worked in the advertising, insurance, and financial industries, but his lifelong passion was baseball. As a young man he played and, in later years, he remained active in it by umpiring, coaching youth teams, and organizing for community youth baseball and softball leagues. 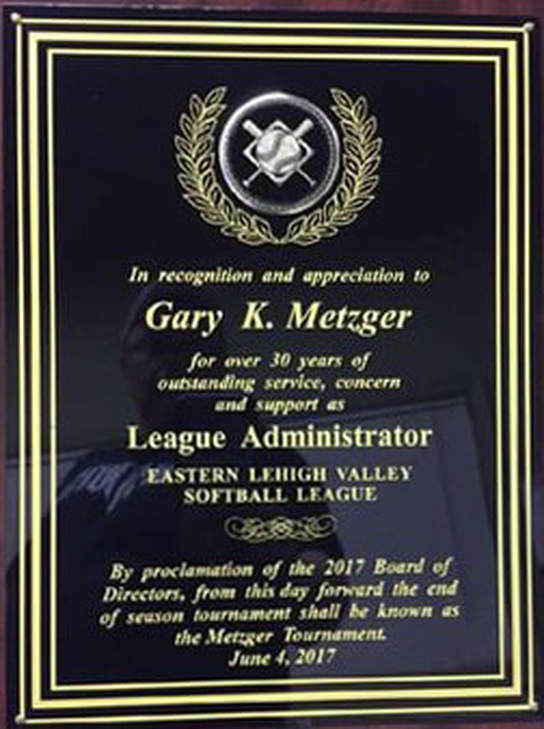 Gary's family wants to make sure the Eastern Lehigh Valley Softball League remains and flourishes for many years and with their generosity would like any donations, in lieu of flowers to go to the ELV. This way we can assure our young ladies always have a fun, safe, learning environment to play this great game of softball. This was Gary's dream and with your generous donations we will try to keep his dream alive! We are not set up as tax exempt but your donations will be used to acquire playing fields and help keep the costs down for fees.